Diabetes | John Frangie, M.D. Diabetes has many side effects and complications on your all-around health; diabetes and vision are entangled in this same way. 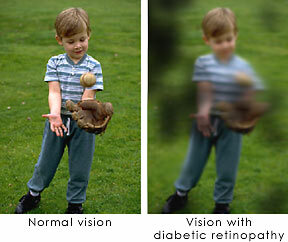 Diabetes and the vision problems it may cause include greater risks of CATARACTS and OPEN ANGLE GLAUCOMA. Another major concern is diabetic retinopathy, a condition in which blood vessels in the retina begin to leak, which causes edema, or swelling. This is a condition which could eventually lead to blindness, and it could occur in anybody who has either type 1 or type 2 diabetes. One potential diabetic retinopathy treatment is a laser procedure known as a focal treatment, which is utilized to try to decrease the swelling. However, the best retinopathy treatment is actually prevention, as even a successful focal treatment procedure may not restore vision. Yearly eye exams and controlling of your blood sugar level is crucial in prevention, diabetic retinopathy may not cause any symptoms at first, allowing the condition to worsen and become more severe before action is ever taken. Learn more about potential diabetic retinopathy treatment in Springfield, MA by calling our office at 413.363.2732 and scheduling an appointment.